Mercedes benz star scanner is a very popular auto scanner in the market. However,Many customer are confused to choose when they want to buy one, because there is four version of mb star:Mercedes Benz star c3,benz star c4, Benz Star SD Connect Compact 4 C4 and super MB benz star C5. So now,i will summarize their similarity and difference,hope it will helpful for customers to choose. 1.Benz star C3/C4 and MB star sd connect c4,Super MB Star c5 use same software. 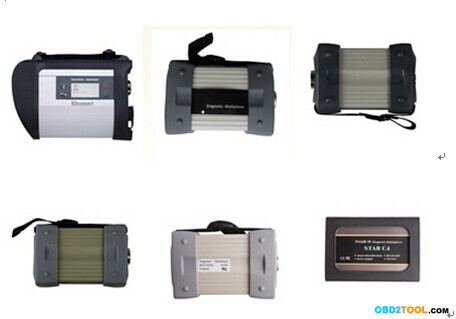 2.For the hardware, Benz star C3/C4/C5 is same function in diagnosing. 1.For the functions, MB star c3 and c4 are almost the same,C4 can do all the works what C3 does and it is the replacement of Compact C3. Just benz star c4 size is small and weight is light,much convience and the anti‐interrupting ability is better. One more thing, as customer feedback, the advantage of c3 is can do trucks best. 2.MB starC3, C4 just can support Mercedes Benz cars manufactured after year 2000. Super MB star c5,Benz SD Connect C4 can support all current and new coming MB vehicles. 3.Benz star c3,c4,SD connect C4 update by Harddisk.That means when customer want to update,they need to send back harddisk to supplier,after finish update,then send back to them again or just buy a new HDD.For the long international distance,it may need about 2 weeks can complete one time update,so it is very trouble and inconvience. Under this suitation,Super mb benz star c5 is release, it is can update through super mb star official web directly, which will be much convience and time saving. In addition,Super mb star C5 work with W204, W207, W212, 405, 451, 452 and 454. Besides the software c3 and c4 own,it added three more software: SD Media, Xentry and Smart TAN Code. Smart TAN Code: Opened special function in DAS program with Smart cars 405/ 451/452/ 454.Besides, it also opened more special functions, such as engineer mode, remove limitations,etc, which Star C3 and Star C4 do not have. 4.Now we turn to MB star SD connect C4 again.MB Star SD connect C4 not only support KL diagnosis and three lines CAN BUS diagnosis, but also support UDS diagnose protocol, Because it have UDS chips. Star C3,C4,c5 don’t have this chip, so they can not support UDS. The most advantage of SD connect c4 is: It can connect to PC by wireless or Lan cable.So it will be much more convience than Benz star C3/C4/c5. Besides, Professional Diagnostic Tools mercedes star diagnostic SD connect C4 interface components used the military quickly inserted techniques that can support one million times plug, more stably;And all of the its core components adopt new original packaged chip, plus 24 hours fatigue test, to ensure its stable release. So in all,each version have its advantage,just see which one is most suitable and interested you. The software program Xentry/ DAS is a bit sluggish on an outdated IBM so that it’s price paying a bit additional and getting a Dell D630. HDD that is pre-loaded with the software program for SDConnect 4 by the vendor, is inserted into the DELL D630… The DELL D630 is the quickest laptop computer with the RS232 characteristic. D-A-S The Analysis Help System, a concise interface and a straight-ahead operation added to a excessive-quality Dell laptop giving Seller level access to code studying and the complete automobile testing systems and sensor reading. MB Star Diagnostic Instrument sequence are the Mercedes-Benz approved supplier diagnostic systems for troubleshooting and programming. Simply give you the self-take a look at report and the number, you’ll find out what’s the matter with this tool to avoid the transport charge when this software need fix. After one yr, if you want to update, that you must pay fee. We’ll show you the photographs of the products and packages earlier than you pay the stability. What is the supply date9 Our products are normally shipped within 45 days after order confirmation. Briefly, they are nearly the same good quality and features, it is as much as you to decide on which one is your greatest needed. High quality Mb Star C3, MB Star C4,MB STAR C5, MB STAR C6 ,with completely different versions now are available in UOBD2. Consideration: Some customers might imagine they will not register the machine till they need to update, in order that they’ll replace to extra new variations within this one yr. Assume how jealous you’re mates shall be if you inform them you got your mb star c3 multiplexer on AliExpress. Get a C3 multiplexer and the earliest version of the software that you could find. MB C3 STAR MULTIPLEXER( BenZ VCI) 2. Sixteen PIN OBD II cable (OBD Diagnostic Socket ) three. 38 PIN cable (Outdated Benz Spherical Socket ) 4. 14 PIN cable (Dash. BenzMercedes Benz Star Analysis systemfrom obd2tuning.com includingMB Star interface,Mercedes C3 multiplexer, MB SD C4, Xentry Connect C5 and other Mercedes Star prognosis Software program Xentry das Hard Disk that may work with MB star C3 pro or MB C4 SD Join. Mb star diagnsois compact three is preofessional for Mercedes Benz all car contains truck! HDD Tremendous mb star package deal included: 1. MB C3 STARMULTIPLEXER (Benz VCI) PIN OBD II cable(obd Diagnostic Socket ) PIN cable(old Benz Round Socket ) PIN cable(dash. Update on Super mb star official webpage free for one year. A: This one has offline coding perform. I used to be very hesitant in buying one of those Chinese gadgets. The opposite option can be to get a C4 system, but then they value extra. It’s extra convenient for customers as a result of the software program for C3/SD C4 diagnostic tool will be pre-installed earlier than delivery. Q:Is this instrument capable of work with Reset the Mercedes-Benz SBC Perform? IBM ThinkPad to work properly. Over time, a whole bunch of laptops were examined for compatibility but solely 2 laptops had been found to work appropriately. Truck Assist Listing:Actros963/four, Actros2,three, AtegoIII, AtegoII, AxorII, Eonic, Zetros, Actros, Atego Gentle, Atego Heavey, HPN M96, Atron, HPN M2000, SKL, FSK. For instance: If the model you purchased is 2013.3 and you don’t register it till 2014.4 software program release, then you’ll discover your 2013.3 hdd can not run 2014.Four software immediately. The software program you get will normally be preinstalled onto a laptop computer or arduous drive for you to install into your individual laptop. Preinstalled is lots easier than doing it yourself and will save you 2 or 3 hours of installing and messing around. Energy can be equipped to unique pc (COMPACT3) through the cables. We offer online service 24 HRs, our after-sales service males can enable you to remedy the problem by teamviewer, just contact the gross sales. Michael Luo was the gross sales rep who instantly responded to my inquiry on the machine and he instantly responded to all my emails and questions within a day at worst. It could readout and erasing trouble code; read the real-time knowledge of sensor and actuator; code and program. Exterior hdd can be utilized on any kind of computers. T30 HDD fit IBM T30 laptop. It turned out that I needed to delete the drive letter from the main partition where my unique XP picture was. Don’t use the model on the hard drive in case it’s contaminated with trojan, virus, malware. This thread will be devoted to a thorough explanation of the Mb Star C3 system in depth, over time. Another good reference thread can be found here. First off, some history and background about the system. The MB STAR C3 is a diagnostic system that is provided by the factory for dealerships and independent repair shops, and is used to interface with the cars’ computers to diagnose systems and pull/reset codes, and even to program certain elements of the systems on more modern cars. The system costs upwards of $20,000 from OBD2TOOL, and is applicable for MBs from model year 1989 and newer. Of course, cars of model year 1989 only had 2-3 computers in the car; however all successive MBs have had an increasing number of computers, and this is where the MB STAR C3 system really comes into its own — with the newer cars. For the purposes of the cars that are the focus of this forum — the 124.036 E500E — and to a lesser extent the 400E/E420 and the later C126 coupes, the computer setups are rather crude and limited when compared to cars starting with the W210 models, which debuted in model year 1996 in the USA. What I’m saying is that the MB STAR C3 systems are much more suited and capable, coming into its own, the newer the car that it is used with. However, the good thing is that it is able to fully exploit the built-in computer diagnostics as found in the E500E. It does this using a compatibility mode that emulates the Mercedes-Benz Hand-Held Tester (HHT), which was a diagnostic tool that was used for the 1989 and up cars, commonly until about 2001 when the MB STAR system debuted. The HHT is literally a hand-held unit (it is actually quite a handful) that allows the user to pull and reset codes, provides access to “live” engine data on the M119 and M104 engines (though a larger array of live data on the M119s), and generally pull compete diagnostics of the computer systems. The MB STAR system, when it made its debut, was much more capable because it was PC-based (IBM T30 laptop), but it was also very versatile because it incorporated a HHT emulation mode (for backward compatibility) along with a “multiplexer” intermediate unit between the PC and the car, which allowed the connection of a variety of different diagnostic connection cables, depending on which diagnostic system the car in question happened to use. For the oldest cars (i.e. the C126, early R129 SL models, early W124s and W140s, etc.) a “four-pin” diagnostic cable was provided. For second-generation cars, such as the E500E, 400E/E420, middle and later R129s, middle and later W140s, the familiar “38-pin” plug is provided. There are also OBD-2 interface cables for model year 1996 and later cars, as well as a 14-pin cable for European diagnostic systems. All of these cables allow the combination of the MB STAR with the in-line multiplexer unit to fully interface with any particular car’s computers. As I said, the MB STAR system debuted around 10-11 years ago, in 2001. Because of its expense, it has been very much “out of reach” of most MB owners and enthusiasts. To pull codes and get information about the car, owners were forced to buy limited testers from companies like Snap-On, Trisco, and others that perhaps allowed one to pull and reset codes, and a couple of solutions provided some limited “live data” where the car allowed it. These systems would typically run from $500 to well over $1,000. The other option was to somehow obtain a used HHT (they are occasionally available via eBay, and are quite expensive) or a used MB STAR system – still a huge expense of multiple thousands of dollars used. In recent years, Chinese forgers, who excel at making fake copies of everything from Louis Vuitton purses to Guess Jeans to Rolex watches, have set their sights on the MB STAR market (and other automotive diagnostic systems for other marques). This has resulted in a cottage industry whereby one could purchase an MB STAR system for anywhere between $600 and $1,200. Over the past year or so, as Chinese copies of the MB Star C4 system have come onto the market, the prices of the MB STAR C3 system have come down to a typical range of $250-450, depending on the vendor and the items included in the package. These “clone” systems are easily available on sites like eBay and also Alibaba.com from hundreds of vendors. As with any Chinese copy of anything, quality varies and quite often — but not always — one gets what they pay for. The recent reduction in price of the MB STAR C3 systems has made even relatively good quality systems very very affordable for the DIY mechanic and/or MB enthusiast — providing them with the same diagnostic power as the dealership mechanic (but not the same level of training and knowledge). Typical options that are available with MB STAR C3 systems available on the Internet include: an array of cables; a multiplexer; a hard drive containing the MB STAR software package; and instructions on how to set up the system. The software typically includes: MB Xentry, WIS, EPC, STAR Utilities; EWA net; Star Browser; Star Finder; and a recent MB parts price list (which goes out of date quickly). Quite a number of vendors also provide Internet support, including the ability to remotely control systems over the Internet (with the user’s permission, of course) to diagnose installation and software problems. There has been precious little information on the Internet about the Chinese MB STAR C3 systems, how they operate, and in general how the system operates. This thread will be a thorough, methodical investigation of how the system works, what it looks like, and how it can be used with the E500E (and by extension, the 400E/E420). It is up to the individual owner as to whether they need or would want such a unit. It would be overkill for many if not most owners. However, there are a number of owners who do want to do their own maintenance and want the tools to help them do this properly. For these owners, purchasing an HHT or MB STAR system may be a good idea. I will not go into the nuances and details of ordering the system. All that should be said is that one should do their research carefully, and pay attention to the ratings from other buyers as to the honesty of a particular vendor. Most of these vendors are based in Hong Kong or on Mainland China. Quite often they speak decent English and are quite responsive and communicative when inquiries and requests are made. It would be recommended that prospective buyers utilize an escrow service to complete the transaction, so as to maximize honesty and straightforwardness of the transaction from both sides. Some vendors offer free air-mail shipping via DHL or other international shipper. These packages can arrive in as little as three or four days after a payment goes into escrow and the seller is notified by the escrow company that they have received the cleared payment. Once the package is received by the buyer, they inform the escrow company that the package has been received in good order, and the money is then released to the seller. Pretty seamless, and because of the escrow service — a fairly safe transaction. Certainly better than sending off a Western Union or Credit Card payment to an unknown party in a foreign land. So, the photos below illustrate what is commonly received with an MB STAR C3 package. It is a 4.5kg (10-lb) box that is nicely packed, and includes all of the items described in the seller’s site. A typical package will include the cables, a USB hard drive (or internal hard drive for an IBM or Dell computer, if specified), a multiplexer box and a packet of adhesive stickers that are placed on the multiplexer and the computer-to-multiplexer cable. The box is unpacked and the contents are checked against the web site’s description to ensure that all contents were included. Some sellers also sell individual pieces of the sets, if they are ever needed. Next, after the contents of the package are ascertained to be correct, the recipient should install the software on a computer. It is HIGHLY advisable that a standalone, separate laptop computer be used for this, seeing as it will be used in a garage (next to the car) environment. For versatility (and because most people don’t own the specific IBM and Dell laptop models that are needed for the internal drives) it is advisable that the buyer specify the external USB hard drive model of the MB STAR C3. This way the hard drive can be plugged into any qualified laptop and used. It is best to just purchase a used laptop via eBay or Craigslist that meets these specifications, and use this computer SOLELY as a DEDICATED computer for the MB STAR installation. It can be kept in the garage and used for these purposes. It really doesn’t even have to be connected to the Internet. One can also put the laptop on a dedicated cart, which allows the computer, cables and a printer (if desired) to be rolled around the workshop/garage next to specific cars. Although the cables are quite long, it’s nice to have the computer next to the engine when using it. 13 – Store operation tried to save a StartKey which is older than existing StartKey with the same application ID. Possibility of using fake old StartKey with higher permissions. I want to buying a device for programming the modules of mercedes which one is safe and updatable? I use C4 with Xentry works good for me. I use xentry 09.2016 works great, you can find premade acronis images and installation version here, just search for Xentry. It’s good for trouble shooting and coding. In some cases online scn coding requires a MB server connection. You find members here that offer scn coding via team viewer. Vediamo is also available I have not used it a lot but it lets you code and program on a deeper level. 1. The host communication connection end USES from design, to avoid inadvertently fall in the normal use of the communication port to connect and communication failure, etc. 2. DC 12 v power supply design/host upgrades to avoid the battery installation/battery voltage instability/host can’t enter the shutdown state, etc, caused by the motherboard and rapid aging of the battery. 3. The host CPU radiator surface and perfectly fit alloy shell, good heat dissipation effect. Equipment running smoothly, don’t crash. 4. The host USES the tamper clasp, should to avoid fragile warranty sticker damage caused by the warranty disputes. 5. Host wi-fi protected the upgrade for PC plastic shell, solid quality does not affect the wi-fi signal. 6. OBD main telecommunication lines connected to the host end upgraded to VGA15 industrial-grade connector. 7. Network upgrade for gigabit connections/pure copper wire core/double layer aluminum foil/woven mesh/silica insulation material. Gigabit communication Against interference/pulling open circuit / / fracture in low temperature. 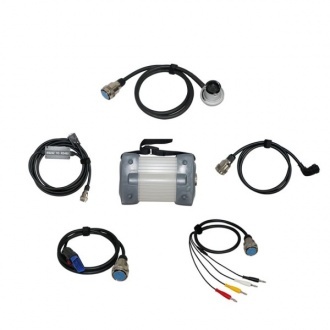 Benz diagnostic tool SD connect c4 wins! It works good in basic obd2 diagnostics, SCN coding, ECU/key programming online or offline on Mercedes cars, truck and Smart as well. MB STAR Diagnostic Tool series are the Mercedes-Benz approved dealer diagnostic systems for troubleshooting and programming. MB STAR series now includes: WIFI MB SD Connect Compact 4 system, Super MB STAR C3 diagnostic system, MB Star C3 multiplexers (best quality, best price and C3 pro with 7 cables) and MB STAR Compact 4 system. MB Star C4 is the newer Star system for newer models and support Mercedes with UDS protocol. SD Connect supports offline/online programming and Vediamo engineering software as well. Super MB STAR is the only Star tool that can be updated online. All MB STAR Diagnostic systems come with multi-language basic software applications. 2.W-I-S net: Workshop Information System Supply the whole view of the wiring diagram in a car, component location diagram and maintenance method. What you do is to enter the chassis number, and then you will get the manufacture data, engine configuration and the car model -all in detail. Super Mb Star C3 comes with more software programs, including Smart Tan Code, Developer model and Benz Disassembly system etc comparing with other Star systems. All MB STAR system are look similar, are they all different? All MB STAR system are look similar (Super MB STAR C3, MB STAR C3. SD Connect C4), are they all different? 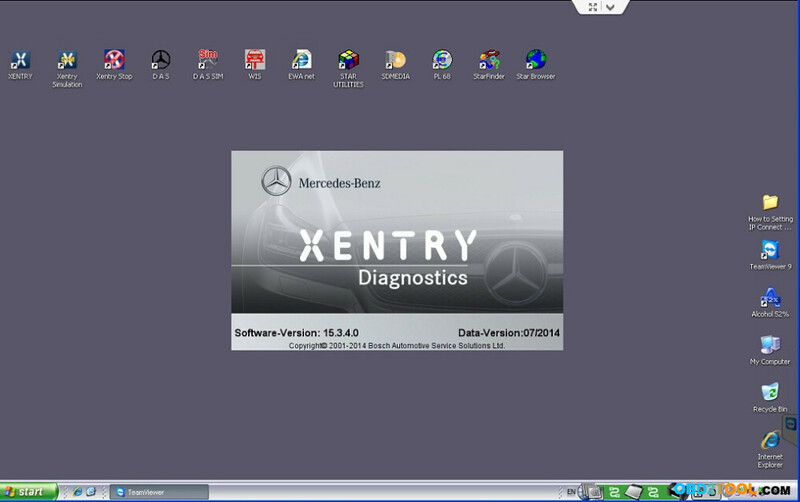 a All STAR system shares the basic diagnostic software, like DAS, XENTRY, WIS, ST Finder etc. Super has much more software than other star diagnostic systems. Super MB SATR C3 has Develc Mode, Smart TAN code etc software etc that other Star tools does not have. b.Super MB STAR C3 multiplexer can be updated online. MB Star C4 SD Connect and C3 Star do not support update. c.MB SD Connect 4 is the newer and most respected Star tool for Mercedes models. d.Best price MB SATR C3 version cannot support Benz trucks. Other Star multiplexers work both cars& trucks. The VT55 triggers all newly mounted TPMS sensors and turns the warning light off. It decodes the sensor data and ensures that the correct tire pressure monitoring sensor is being read and isn?t a radio frequency transmission from a key fob or other sensor. The process allows the user to display the data on screen but also to transfer it to a PC and print out results outlining which sensor is faulty and why.The ATEQ VT55 OBDII TPMS Diagnostic Tool displays sensor ID, pressure, battery status, temperature, accelerometer and more. Cars in normal operation, the automobile electronic control system signal input and output (voltage or current) will change regularly with a certain range; electronic control circuit when the obd2 scan tool is abnormal and beyond the normal range of variation, and this anomaly does not disappear at a certain time (three continuous stroke) within, ECU determines that a failure of this part, the fault indicator lamp is lit while the fault monitor in the form of code stored in the internal RAM ( RandomAccessMemory: Random Access Memory), is the fault code stored in the maintenance can be read by the fault indicator lights or OBD2 scanner. If the fault is no longer present, the monitor after three consecutive times to the relevant signal is not received, the command displays the fault light goes out. Fault indicator light turns off after engine warm cycle about 40 times, the fault code will automatically be removed from memory. Software language: Chinese. English. Croatian. Czech. Danish. Dutch. Finish. French. German. Greek. Hungarian, Italian, Japanese. Korean, Polish, Portuguese, Romanian; Russian. Spanish, Swedish& Turkish. Note: WIN8 System HDD/SSD does not support HHT-WIN! Software version newer than V2015.12 does not support HHT-WIN! 2.W-I-S net 2016.03: Workshop Information System Supply the whole view of the wiring diagram in a car.component location diagram and maintenance method. What you do is to enter the chassis number, and then you will get the manufacture data, engine configuration and the car model -all in detail. Displays: Depending on the information transmitted by the sensor, vt55 ateq will display sensor ID, pressure, battery state, temperature and accelerometer information. Indicators: LEDs: low battery, transmision, PASS and FAIL. Buzzer. Connectivity: USB port with included USB cable, PC driver and software. Because the United States and Europe, using two different emission regulations, so the second-generation on-board diagnostic system OBD II, EOBD two forms. U.S. implementation of OBD II, and the use of European countries to implement emission regulations EOBD system. From the source, the American OBD II system implemented earlier and more stringent standards. EPA regulations in 1996 after the production of cars and light trucks (load at 6.5t or less) of electronically controlled systems require configuration OBD II system and start all car manufacturers cars and light trucks in the January 1, 2000 are you must configure the OBD II system. In 1998, Canada implemented OBD II system. Europe began the gradual implementation from 2000 EOBD system in 2001 all new production of cars in Europe (Load 2.5t or less) is limited to the gasoline engine configuration EOBD system, and the Professional Diagnostic Tools for diesel engine cars to the 2004 mandatory EOBD system configuration. In the relevant provisions of the Central European emissions regulations no OBD II our current standard has been promulgated in, but with the implementation of the Euro Ⅲ standard, EOBD use certainly on the agenda.